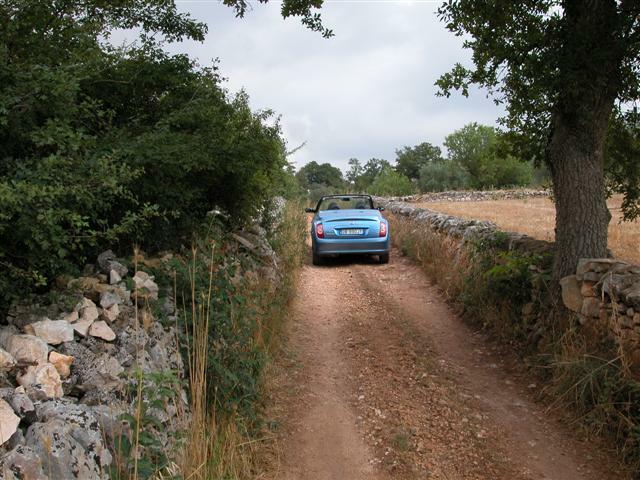 The Hovel is down a dirt track known in Italian as a "Strada Bianca" - literally "White Road" - which well describes this dry and dusty, narrow limestone track. Everything is covered in fine white dust including my best deck shoes. As we were going out for a meal I thought I had better give them a clean. Burgundy shoe polish is not on my normal holiday packing list so I thought I would improvise with the furniture polish - a bit of silicone wax, neutral colour - just the job. Unfortunately I grabbed the "Raid" fly spray and gave my shoes good dousing before I noticed my mistake. So my feet should be free of flies and wasps for a while.